Thank you for speaking with us the other day. 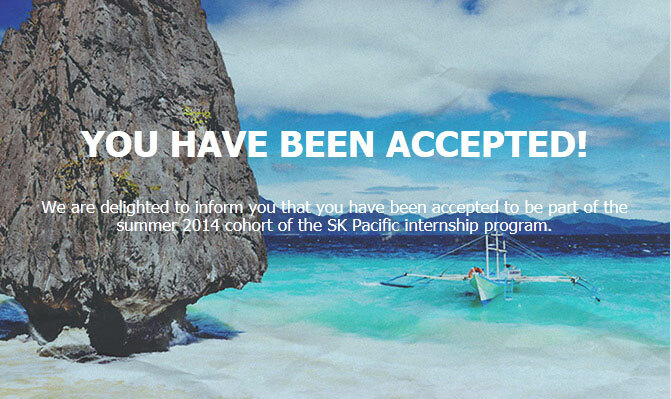 I am delighted to formally confirm your acceptance into SK Pacific's Summer 2014 internship program! After reviewing your profile and interview details, we believe you would make a great match for a few of our business partners within our organizational network. I was very impressed to hear about your professional goals and aspirations, and your enthusiasm for travelling abroad and experiencing new cultures. We believe you are qualified to participate in our program, and we look forward to providing you with an incredible experience that will surely help you build a successful future. We will coordinate with our extensive network of partner organizations to ensure we arrange you with an internship role that meets the needs of your career goals. & Optional travel opportunities throughout the region. Once you have placed the deposit, we can then send your profile out to our business network to find you a compatible organizational match. Furthermore, by confirming your spot, you agree to our terms and conditions. Please note that the deposit establishes your commitment to the program and comes with a full money back guarantee in the unlikely event that you are not placed in your preferred internship industries. We hope this gives you the peace of mind that will allow you to look forward to an exciting internship experience abroad! We accept Paypal payments exclusively to ensure the security of the transactions. No need for a Paypal account. All you need is a valid credit/debit card. Please acces our payment page to complete your deposit. Upon a successful corporate matching, you will receive details about your matched company, internship position roles, and supervisor contact information in a Pre-Departure Packet which will be sent to you between the first week of March and the last week of April. The remaining balance of the program fee will be due 30 days after receipt of this packet, or 30 days prior to your scheduled arrival date, whichever is sooner. Congratulations, and we look forward to speaking with you soon!